Katherine, Kate, Mary and I went to the Karori Cemetery this morning and set up nets at a slightly different location with the hope of getting a few more birds. Unfortunately for a variety of reasons the others were later in arriving and I had the biggest catch of the day just after the first couple of nets were erected. We caught a total of 15 birds with 11 Silvereye, (all caught from one flock before the others arrived.) 2 Chaffinch, 1 House Sparrow and a recap Blackbird which was originally banded almost exactly a year ago. Katherine taking a moult score under the watchful eye of Kate while Mary, our scribe waits to record the details. Shortly after I arrived home a large package was delivered, it contained an awesome book "The Princeton Encyclopedia of Birds". It had been sent by Grace an American woman who had spent a couple of years here in Wellington in 2009-10 and had taken part in many banding session. She had been an able student and had left as a competent bander and mist netter. She has continued her banding activities back in Minnesota and has now been issued with her own sub-permit to band birds there. The book was sent in appreciation of the start she had been given here with the Group. Mary, Kate, Katherine and I had another attempt to catch Tui at the Karori Cemetery this morning. With re-positioned nets we had hopes of a better catch than on Monday but it was not to be, we only caught 1. As well we did manage to also catch 6 Blackbirds and 2 Song Thrush. The Song Thrush were only the 5th & 6th we have caught at this site in the 10 years we have been banding there. There was no sign of any Bellbird today but there were a surprising number of Keraru about and we had a fly over of 3 Parakeets, the first I have seen there, almost certainly "escapees" from Zealandia. Karori Cemetery Monday 21 April - only a few birds but an old one. A group of us set nets at the Karori Cemetery this afternoon. We had hoped to catch some of the Tui feeding on Strawberry fruit (Dogwood) and perhaps catch a Bellbird or two that were about. We were not very successful as although there were plenty of Tui about we only managed to catch 1 and although a couple of Bellbird went close to nets none went in. 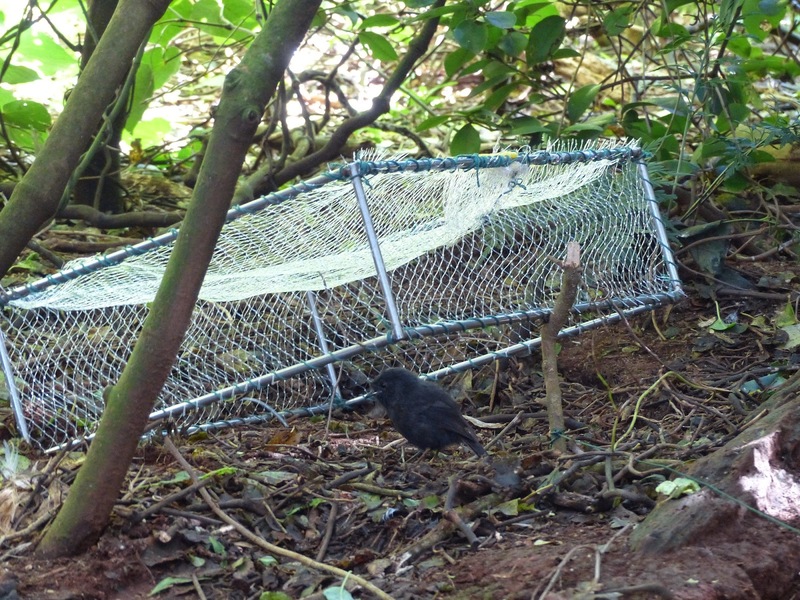 We did catch, as well as the Tui, 3 new Blackbirds and recaptured 1. The recap was a good one, banded in May 2007 it is now aged as an 8+ and at 2521 days from banding is the oldest bird of any species recaptured at this site. A group of us had a session at our Island Bay site this morning, unfortunately it was fairly quite with an exceptional lack of variety. Ken had warned me that bird numbers were low, no doubt due to an abundance of natural food in the form of seeds and berries about at the moment. The catch rate was further reduced by rain shortly after the nets were erected making it necessary to close them for a period. We managed to catch 29 birds, all House Sparrows with 22 new and 7 recaptures. Almost all the Sparrows have now finished or almost finished with 23 having a primary wing score of 44 or 45. This male has completed its moult and is looking very handsome. However there was a recap that appeared to be struggling to get its moult completed.When banded as a juvenile last month it had just started moult with its primaries scored at 5, 4, 2, 0,0,0,0,0,0 = 11 now it has 5,4,4,4,1,0,0,0,0 = 18. P2 doesn't seem to have continued to grow and other feathers are very slow. Feathers are scored between 0 (old) and 5 (new). Still only having a score of 18 this young fellow might struggle over the next few months. With it hosing down outside I have a bit of time to crunch the numbers for the last banding year, 1 April 13 to 31 March 14. Recaptures For the year 2790 new birds of 17 species were banded, this is our lowest total since 09/10 and well below the 5 year average but only slightly below the 9 year average. The number of birds recaptured was higher than the last 2 years but well below 10/11 with the highest number of Greenfinch recaps since then. Species caught ranked by the number of new birds banded. 2 House Sparrow - 822 (134) Usually at No 2 and above both the 5 yr & 9 yr average. 4 Chaffinch - 140 (9) Usually at 4 or 5 and very close to the 5 yr average but slightly below the 9 yr. The number of recaps well below recent years. 5 Blackbird - 111 (70) usually ranges between No 4 & 6. Below both the 5 yr and 9 yr averages, there appears to be a drop in Blackbird numbers about the city in recent years. 6 Goldfinch - 75 (6) numbers up on recent years mostly due to good numbers of Juv's caught at stream sites. 7 Grey Warbler - 59 (17) the big mover with the ranking last year at No11. Great to see this little beauty doing well. 8 Tui - 46 (5) Slightly down on most years mainly due to catching effort rather than lower numbers. 9 Dunnock - 42 (13) About an average number. 10 Starling - 37 (25) Following the trend of recent years of lower numbers. 11 Fantail - 31 (4) Slightly below average but can be hard to catch and even harder to recapture. 12 Yellowhammer - 12 (0) Well below the average but the numbers of this species fluctuates from year to year. Small numbers of Song Thrush, Eastern Rosella, Kingfisher, and Bellbird were also caught but no Redpolls. Forty two bird were recaptured or sighted by colour bands during the year. This is up on recent years mainly due to an increase in old Silvereyes caught, many during the influx of birds in July. Many of the Tui reported are of colour band sightings, this number is expected to decrease over the next few years as the number of colour banded birds reduces. We had a quiet day at the Zoo on Saturday although against expectations we did get some banding done. The forecast was not good and we did have some rain requiring the furling of nets for a while but for the most part it held off. Fortunately we had the use of the last of the old feed sheds from the original bird area which is about to be redeveloped, so we remained dry. There was a very good group of banders and helpers that had no trouble keeping up with the flow of birds and with the low catch rate we knocked of a couple of hours earlier than usual. We caught a total of 35 birds of 7 species with 29 new and 6 recaptures. Greenfinch - 0 (1) a bird banded in Oct 2010 and it was very unusual not to catch a lot more. Silvereye - 1 (0) a very low number, on 13 April last year we caught 28 new and 9 recaps. Starling - 0 (1) this bird was the highlight of the day, banded Dec 2005 as an adult so is at least 10 years old. It is the oldest Starling recaptured at the Zoo, (we have a recovery that is slightly older). It is also the second oldest Starling we have recaptured at any of our sites. Surprisingly this is the first time it has been caught since it was banded. Two of our group, Annette and Nikki have just come back from 3 weeks on Rangatira Island, a Nature Reserve in the Chatham Islands. The main purpose of the trip was to monitor the breeding burrows of endemic Chatham petrels for invasion by broadbill prions and to do a complete census of the Black Robin population and colour band all the juveniles. This year they used drop traps to capture the Robins instead of the more usual clap traps. A set of five traps were custom-made by an Upper Hutt engineering firm to fit one inside the other for easy transportation to and from the island. 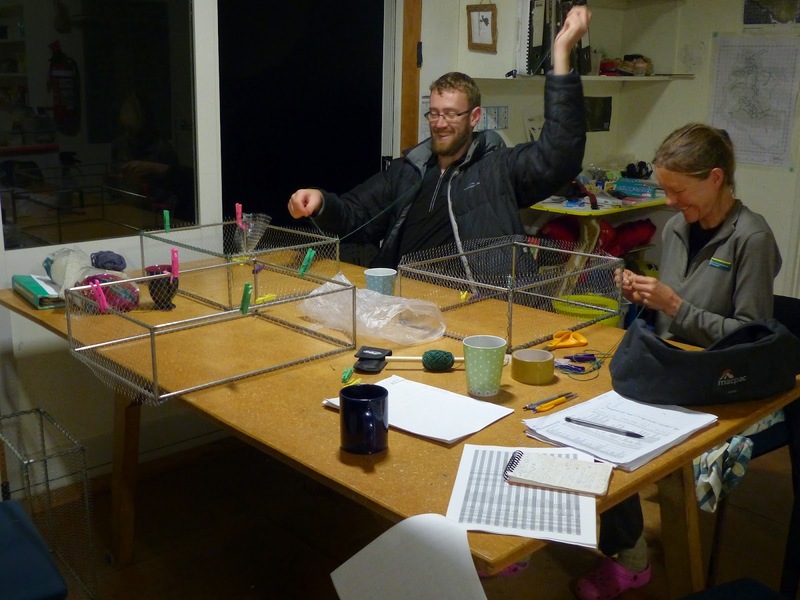 Despite working well, the traps proved a little cumbersome to carry around in the dense bush and muehlenbeckia on Rangatira, prompting much discussion about the possibility of developing a collapsible version! Triggering of the trap is carefully timed for the moment when the robin is facing the back of the trap and lunging forward for a mealworm, as this virtually eliminates the risk of the bird escaping the trap or being struck by the frame as it drops. On returning to Chatham Island from Rangatira, the Black Robin team took the opportunity to visit the Chatham Albatross translocation site near Taiko Camp on the edge of the Tuku Nature Reserve. 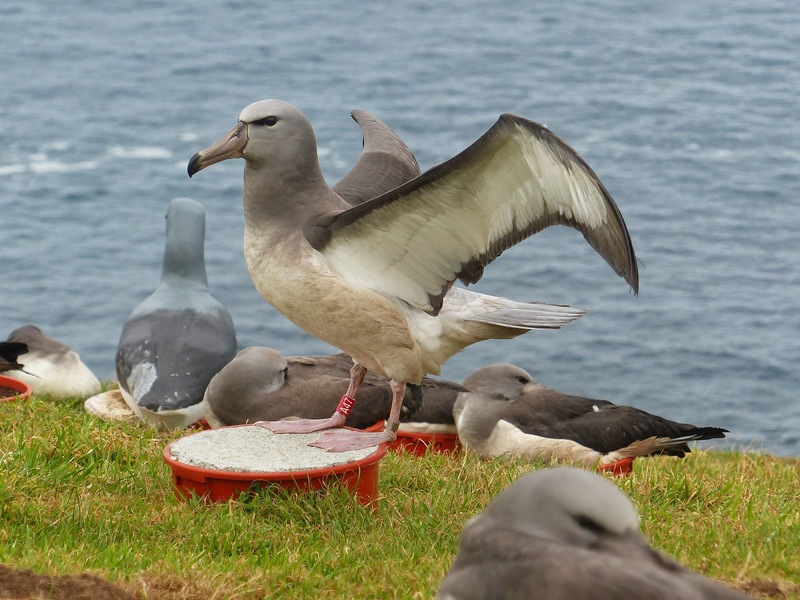 The Taiko Trust has translocated 50 Chatham Albatross chicks from their only breeding colony on the Pyramid to a site on the SW coast of Chatham Island. Taiko Trust staff and volunteers have been feeding and monitoring the chicks daily for the past three months, and by the day of their visit the 46 remaining birds (4 had already fledged) were on the verge of taking their first flight. They all felt extremely privileged to have had the chance to visit the site of NZ’s first albatross translocation and only the second such translocation to be attempted anywhere in the world. There were three banding sessions on Friday and Saturday but very few birds were caught. Mt Albert - Friday 5 April. With calm conditions I put nets up at the Mt Albert fennel patch on Friday morning. I had expected a drop in Silvereye numbers, but not this rapid. After catching 40 on Tuesday I only caught 5, 4 new and 1 recap, also 1 Dunnock. If there is a calm morning in the next week I might try again otherwise that will be the last at this site for this year. Houghton Bay - Friday 5 April. Later in the morning I spent an hour or so at the Houghton Bay stream mainly to see if there were birds about. Caught 10 new birds, 6 Silvereye, and 1 each of Fantail, Grey Warbler, Chaffinch and House Sparrow. With hind sight I wish I had stayed a bit longer as on Saturday a group of locals "cleaned up" the stream altering and opening it up considerably. It might be some time until the birds settle down and make it worth while attempting to catch there again. Prince of Wales Park - Saturday 6 April. Katherine, Matu and I had a session at the Prince of Wales Park stream on Saturday afternoon. After checking the site on Wednesday and finding a considerable number and variety of birds I had high hopes of a good catch. Unfortunately I was wrong and we only caught 3, a new Chaffinch a House Sparrow and a Goldfinch recap. The Goldfinch had been banded as a juvenile back in January, tentatively sexed as a male, and I think I can confirm that it is still most likely male. Katherine is hoping to progress towards her grade 2 banding certificate so she was able to at least practice on the few birds we did catch. Not sure why there was such a low catch rate but perhaps it was because of the exceptionally heavy morning dew meeting the birds H2O requirements. I had another session at the Mt Albert fennel patch this morning, it was near perfect conditions, calm with high cloud. Caught 40 birds, all Silvereye, with 30 new and 10 recaps. The oldest recap was banded last June and 2 of the birds were banded at other sites but not very far away. There was no bycatch although a Redpoll bounced, and if it had stuck it would have been the first Redpoll caught in over a year. We have now banded 176 Silvereye at this site this year which is the most in one year. Most years we catch very few after the first week in April so I expect our numbers to drop away but still hope to catch a few more.